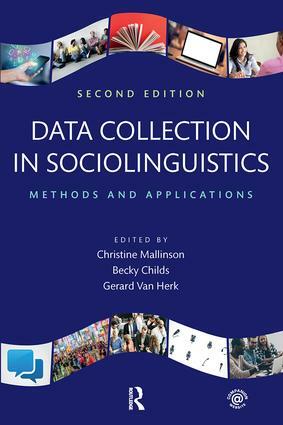 "Since its first edition, Data Collection in Sociolinguistics has provided an up-to-the-minute overview of the issues facing the sociolinguistic researcher. The lineup of authors, the range of topics and contexts, and the nuanced handling of complex issues make this volume crucial for seasoned researchers as well as students just entering the field." "The last few years have seen various introductory books on sociolinguistic methodologies. This one is certainly one of the best buys on the market – sophisticated, up-to-date, and innovative while at the same time authoritative and highly accessible; simply everything researchers, old and young, need to know!" Christine Mallinson is Professor of Language, Literacy, and Culture and Affiliate Professor of Gender and Women’s Studies at the University of Maryland, Baltimore County, USA. Becky Childs is Professor of English at Coastal Carolina University, USA. Gerard Van Herk is Associate Professor of Linguistics at Memorial University of Newfoundland, Canada.